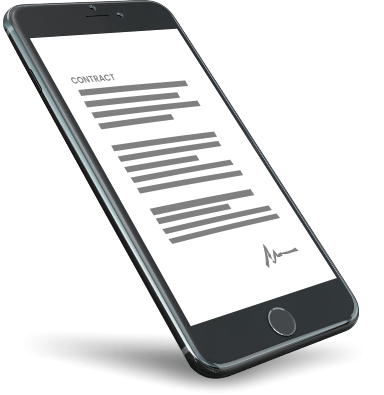 Easy-to-use and secure eSignature abilities transmitted to your iOS apps with the eSignature SDK for IOS. Our eSignature SDK for iOS provides developers an easier way to help integrate PDF viewing & adding eSignature on PDF with their iOS applications. This SDK provides built-in UI elements for viewing PDF document. As a result, developers need to add only 4 lines of code to their application to have a PDF reader on iOS platform. This SDK is robust enough to fulfil all E-Signature necessities for any industry. Seamless Integration Mobile App developers or solution agencies can easily customize their UI to integrate e-signature capabilities to iOS apps. Happy Customer, Happy You When you have a better customer experience, the hard work is paid off. Accelerate business transactions by including it within your application. Feature Rich with PDF Viewer it's high and feature and low on botheration. Along with that it comes with an integrated PDF viewer that makes job even smoother. Simple User Interface Simplicity matters and the iOS SDK is built to simplify integration to your iOS apps. Start running with the development in less than 30-40 minutes. Order Now From Kick-Start to Auto-Start. Integrate your iOS App with E-Signature, the Easy Way. Tried to answer some of the most enquired question, which will clear your doubts as well. 1. What exactly is iOS Signature SDK? Ans: Add easy-to-use and secure eSignature and transaction capabilities to your apps with the iOS Signature SDK. With built-in UI elements for viewing PDF document it becomes easy for the developers to add some short line of codes to their application to have a PDF reader on iOS platform. 2. What happens after I Order the iOS SDK Signature Package? Ans: Once you place your order, our iOS Team gets in touch with you to know more about your requirements and expectations. Post discussion, we send you an invoice followed by the iOS SDK Signature package to your registered email ID. 3. Are there any Hidden Costs in the Contract? Ans: No, there aren't any. The original price of the SDK is at $1,499, though the present discount of 10% makes it to $1,349. You have our word on this and the same will be placed in the invoice. 4. What are the payment methods? Ans: We accept all the popular modes of transaction such as Credit Cards, Wire Transfer & PayPal. Choose your favourable mode & we're good to go.